You know how sometimes you have a preconceived notion of a random food item, and refuse to touch it based on that preconception? That was me and blue cheese dressing. My scorn for the popular salad topping was based purely on my experiences with the store-bought bottled variety of Blue Cheese dressing, and I’d never known any different. To this day, the thought of it makes me a little bit sick. I became fond of blue cheese about four years ago when I started working part time as a server at a local high end steak house. One of my coworkers coerced me into trying the homemade blue cheese dressing. I succumbed to the peer pressure and dipped the corner of carrot stick into the thick, creamy concoction and was fully prepared to wince in disgust. But it was blissful and I was immediately a convert. Although I have always been a ranch girl, I now find myself craving blue cheese dressing. The other day that craving hit, so I decided to whip up a batch at home. This recipe comes together easily and gets even better if has a little time to hang out in the fridge before serving. It’s the perfect topping for a crisp salad or plate full of spicy chicken wings. Combine mayonnaise, sour cream and milk in small bowl; mix until smooth. Stir in vinegar, Worcestershire sauce, sugar, salt, pepper and garlic powder until well blended. Fold in cheese. Transfer to container with tight-fitting lid. Chill until serving time. Stir well before serving. This recipe is still incredibly tasty if you substitute in reduced fat mayonnaise and sour cream. 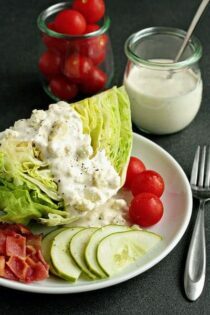 Recipe for homemade blue cheese dressing adapted from Sargento Cheese. Great idea! Nothing like homemade dressing! you are certainly right. homemdet this dresing blue cheese is super good. I adore blue cheese dressing and think I just found the perfect recipe! Thanks for sharing this! Ok, so I have eaten a salad almost every night for the last two weeks. I have given up gluten (except for cake sampling!) and this salad look SOOOOOO good!! I made BLT’s for the kids one night and threw some bacon on my pitiful lettuce and it was delicious. I have never done that before! Then seeing some nestled so sweetly on your plate just brought me to a “happy place”. :) Anywho! Rant over. I would inhale that entire wedge of lettuce. Now. Husbands favorite, I’m sure he’ll enjoy tweaking it to get it just how he likes it for his burger tomorrow! I so wish I had this for lunch! It looks delish! Wonder how long this would stay fresh in the fridge. Not that it won’t get eaten up soon but wondering the approximate shelf life??? Who knew that there was another person in the world like me? I have never been a lover of blue cheese dressing. The smell alone is a bit gaggy for me. However, I’m addicted to incredibly wet, spicy Buffalo chicken wings, and blue cheese is really the only dipping sauce that does them justice. Knowing what’s in the dressing makes it a WHOLE lot more palatable. Thanks, Jamie! If you try this, I hope you LOVE it! It would definitely be perfect on wings! How long would this stay refrigerated? I’m guessing it would last a week? Thank you for posting. Its sounds delish!! I would say no longer than a week. Thanks so much for stopping by. Blue cheese is our family favorite, and yours looks like it has just the right amount of actual blue cheese chunks in it. Can’t wait to try it out. How long does this blue cheese dressing last as you said it taste better over time but how long? I would say no longer than 3 days. Thanks for stopping by. this is an old favorite of my Dad’s…….but we always used Maytag Blue Cheese, from Newton, Iowa…….I think it would last a week, but it never was around that long…..also, never used low fat mayo, but lowfat sour cream is ok…..
but, Sargento is great cheese, and thanks for the recipe! I googled “blue cheese dressing” and found your recipe. Just made it and it’s awesome! I’m linking this to my Facebook page so everyone can see how good it is! I make the same recipe, but instead of sour cream I use greek yogurt! Love it!! This is the best blue cheese dessing I have ever had. I added a drop of tabasco sauce to it and refridgerated it over night. Taste so much better the next day. I have made this dressing severval times, and ill continue making !! best blue chesse dressing and so easy! thanks for sharing! This is soooo yummy, thanks! I am so glad to hear you enjoyed the recipe! Thanks so much for stopping by! If you add Tabasco sauce to any blue cheese dressing recipe, it makes it 100000X better and give it a little bite. :) no one will know and will ask you what your secret is! I used to work at a upscale restaurant and I always added Tabasco to the dressing when I made it and people RAVED about it. Give it a try, I promise it will be good! I LOVE this tip – thanks so much for sharing. I’ll definitely be trying this the next time I make blue cheese dressing. Have a great day and thanks so much for stopping by! Hello I was looking to make this too but I have one question for u about the ingredients i have everything to make this but the wine vinegar i have regular vinegar would it be OK to use regular instead? an the garlic powder can I use garlic salt instead?? Hi, Brittany! You can definitely use regular vinegar, and if you’d like to use garlic salt, don’t had the 1/2 teaspoon of salt called for in the recipe. Taste the dressing and see if it needs more salt, and add more if you like. I hope this helps! Enjoy the dressing! How long will this blue cheese recipe last in the refrigerator? Hi Marian – Recipes like this will usually last for a few days in the refrigerator. Thanks for stopping by!